ANSWERS: By God ! : WHEN DID LIFE BEGIN ON EARTH? How long did it take consciousness to attain life or is consciousness already alive? There has been much written recently in scientific circles about the beginning of the universe, the world and of life itself with as many varied opinions espoused as there are scientists peering into the cosmos searching for answers. I won't dwell on the universe part of the matter too extensively in this article since I prefer to address and hopefully clear up distorted conceptions about the beginning of life on Earth, or at least conscious life, and this will assume the existence of an earth already existing in an inner universe of divine subjectivity. In truth, you cannot separate the beginning of the universe, the world and life on this world or on any other world. I realize the complications involved in attempting to explain this in terms of time and space, but an attempt should be made and I am just the person to give it a go. Even with simplifications, explanations are most difficult since in greater terms, the earth, environment and its creatures, created each other in a great orchestration of life, a wave of consciousness that transcends the birth of humans and all other species. You are looking for answers in terms of time and space under the auspices of beginnings and endings and the search for answers can never be fully understood until you come to grips with the fact that the passage of years, decades, centuries and eons had very little to do with the emergence of life on planet earth, although you may see it that way. In very real terms, the universe is created in each and every moment. These are not simple matters as you have been taught, but complexities exist that would tax the intellect of the highest order Entities, so bear with me and I will try to make it somewhat understandable. In order to first get some foundation for this article, I am inserting the "dictionary" definitions of what "life" really is in the first place. Life is the condition that distinguishes organisms from inorganic objects. Life is an organism that is being manifested by growth through metabolism, reproduction and the power of adaptation to the environment through changes originating internally. Life is a state of existence or principle of existence conceived of as belonging to the soul, the general or universal condition of human existence. Well now, that should get us started. One of the major problems in understanding the emergence of life on planet Earth is first establishing the emergence of the earth itself, and exactly what is alive and what isn't. The above definitions have some truth, but they are still far off the mark since they tend to view life from the human perspective only. One of the main misunderstandings results from the misconception that consciousness sprung into being from some chance but auspicious convergence of the exact required proportions of chemicals, minerals and electrical charges from environmental sources combining in some hypothetical primordial cauldron-like pool on some already existing landscape, that would result in the forming of elemental proteins that somehow became biologically and consciously alive. And that's where the problem lies with this flawed concept. This scenario simply could not have happened because consciousness always comes first and is the creator of matter. In this case, consciousness would have to have created the earth, the environment and the chemicals, the minerals and electrical charges before that which already existed could exist. 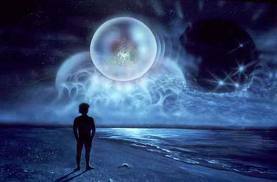 Consciousness creates matter in the earth plane and other types of quasi-matter in other reality systems not focused in physical constructions like the earth reality system. Consciousness is the medium that propels energy into matter and matter back into energy. If you don't believe me, ask Einstein. Life on earth was not born or created because of some earthly accidental event, but because of a subjective creative act, an inspirational illuminating breakthrough of consciousness that created the earth, the universe and all other planes, fields and dimensions containing other dimensions, planes and fields at the same time that it created all beings and creatures of the earth and all such manifestations of what is commonly called living matter. And this, my friends is the best part of this story of beginnings. Consciousness lives and is aware of itself as a particle or identity or a wave or force, whether it is occupying a physical body or not and of course I cannot prove this to you in physical facts, but you will certainly find out upon your death when the physical body is discarded for one more appropriate for the new environment that you will find yourself in. Your dream self exists and it has no physical presence, as you know it. Life does not demand a physical presence. Due to your unique type of physical focus, it would be fruitless for me to try and convince you that the existence of a self-aware non-physical psychological essence of consciousness was and is alive, but if you want to take it back to the original source, the consciousness of God or of that Energy Source always existed and had no beginning as you understand beginnings. But we will have to content ourselves at this time with considering the beginning of life as the beginning of "Physical Life" on a "Physical Earth". There are as many kinds of consciousness as there are kinds of physical matter, whether you consider them alive or not, that compose the earth, and all of these myriads of consciousness are to one degree or another, self-aware, some more than others. In other words they recognize their individual state of being. Since consciousness creates physical matter then becomes part of its creations, the body of the earth, the skies, the oceans, mountains, plateaus and all other physical things, including you, were created by consciousness and "alive" consciousness resides within all physical matter with no exceptions. It has been suspected by many people for quite some time that the body of the earth has its own consciousness and this is true. (You may or may not consider this type of consciousness alive). Consciousness is ALIVE and quite as effective whether in a physical body or not. Consciousness creates matter and becomes a part of the matter that it creates, so working backward, consciousness and Life are within God, Entities, Souls, Earth Personalities, the animals, the Environment, Nature, the rocks, water, clouds and all other things of substance and mass that you call objects. Many cultures of the aboriginal type that you would consider below yours in stature have known of the life spirit within all of the above centuries ago, and they intuitively honored all earth spirits. You arbitrarily choose to draw the hypothetical line between what is alive and what is not. If you were more liberal in your classifications, you could understand how a rock possesses a certain overall awareness of being. Not personified awareness, but awareness of its circumstances, its environment, the position of the sun, the temperature and such. I am not suggesting that the next time you step on a rock, that you tip your hat and say, "have a nice day", but I am suggesting that you understand that you are part and parcel of a grand gestalt of living, awareized consciousness, not personified, but aware of its existence within its own limitations. You, as living people have congratulated yourselves on your dominance over all other things since you seem to have subdued nature, the animals and the environment and because of your technological achievements that perception is understandable. Your holy books tell you that you should dominate nature; You are nature! Certainly your position and limited perceptions would cause you to believe that since you are unable to perceive the consciousness within even the smallest particles such as electrons, protons, atoms, cells and molecules, you would label them as dead or being magnanimous as you sometimes tend to be, you may grant them some modicum of limited conscious awareness. The wiser among you know that is absolute rubbish, to put it mildly. Every self-respecting atom, molecule and cell possesses self-aware-ness, whether you see fit to grant it that quality or not. You live within and amongst a conscious universe and if you choose not to call that alive, that is up to you, but latent within your cells lies the knowledge that there is really no separation between you and the most distant star with no point in-between that is not conscious to some degree. In that respect, your cells know more than you do. Where you see objects there is objectified and manifest consciousness and what you call the space in-between objects, whether they be tables and chairs or stars and galaxies, there is un-manifest consciousness and no space is empty. There is no hypothetical point in the entire universe that is not conscious of itself. So there is no misunderstanding in what I am eluding to; you exist in an almost unfathomable gigantic alphabet soup. Pretend if you will that in this alphabet soup, the vegetables are the stars and planets, the noodles are what you would call living, conscious identities and the broth is un-manifest consciousness not yet materialized that you call space, and as you can imagine, there is no real separation between any portion of the soup and there is no practical separation between all of the objects and events in the universe. But I know what you really want to know, so now we can begin with the assumption that you do draw the separating line within the more limiting dictionary definition stated above. Please try to bear in mind that although I try to explain these unfolding's in terms of time, they actually happened simultaneously and spontaneously and they are still happening in like manner today. You, of course, must interpret them in a linear order through the lens of time and space, so I will also do so. In time terms the life that you recognize was not the first kind of life that roamed the earth, and I can hear some readers misinterpreting what I am saying here, but the environment, the animals and countless versions of humans explored the earth at approximately the same time in what you would call pre-history. These first earthly inhabitants were at first, not physically viable, but existed in a dream-like body. The early earth was a dream like world and in time terms was at some point bound to awaken. Dream bodies merrily skipping over dream landscapes populated by dream flowers and dream trees, laden with with dream birds were learning as they dreamed themselves into physical existence. The die had already been cast, but the transition from dream bodies to physical bodies took time to accomplish, actually eons. The earth and all of its inhabitants dreamed their physical forms or bodies into existence. All were bound to awaken and as their dream bodies became physical, this became imperative. Obviously, the dream environment had to awaken first, then the animals and finally humans with other human offshoots awakening in their own time. Evolution did not happen as it has been hypnotized, but there were great explosions of abilities and propensities within all species. In the beginning all species were present much like the remaining ones are today. Some species died out rather quickly, they did not take and adapt well to earth conditions at the time. These species still exist and have already reentered or will at some time reenter physical life either on earth or on any one of probable earths more suitable to their species. There is no species once created that is extinct although it may appear so to you from your perspective. There are some species that have exited the earth plane but their existence is written in the expanded present of the inner universe and they are bound to emerge again somewhere, sometime. In those terms, the dinosaurs are not really extinct; they have simply departed from the earth reality system for future physical lives in other systems more suitable to their needs. The early humans were the first sleepwalkers spoken of in many aboriginal societies. These early earth inhabitants existed in dream bodies and quasi-dream bodies for centuries before they became sure enough of themselves and their surroundings to leave the security of their non-physical dream like existence for a more tangible physical body. It is important to keep in mind that the earth, the plants, the animals and the environment was also present in this multi-faceted dream world in the beginning. Now, you will have to decide whether you will consider those first dreamtreaders alive or not, since they did not yet occupy a true physical body, but in all other aspects, they were alive, cognizant of their environment, had relationship's and developed primitive societies, while on the other hand they were slowly adapting their dream bodies for ones more substantial in a world of physical matter. In terms of time, you will see this period as evolving from dream bodies into physical, but this all happened spontaneously and simultaneously, in an instant explosion of divine inspiration of All That Is. Your dreaming self that you awaken to when you sleep is a very real portion of your total identity, so I ask you, would you consider your dream body or dream self to be alive? If you do not consider this intimate portion of your identity as real and alive, and frankly, I don't see how you could not, then you could say that living identities cautiously ventured forth on a planet still in a state of awakening from a dream and gradually got their sea legs and adopted a physical body over a very long period of time. In terms of time, which unfortunately we cannot avoid, this began many billions of years ago and took eons to accomplish, so you will be forced to view these happenings through the lens of time and evolution. The earth, the universe and all identities are actually created new in each nano-second and the beginning of the universe will happen tomorrow. In very true terms, the earth is being formed today in every instant, in this very moment, in every moment and this is not some metaphysical mumbo-jumbo, the earth, indeed, the entire universe is created in the NOW and in every conceivable instant a new earth is created. The energy that will create the earth tomorrow is as new as the energy that created the earth billions of years ago as atoms and molecules formed themselves into a myriad of forms that suited their needs, abilities and purposes. The world as you know it built itself from the inside out, emerging from an unimaginably vast, subjective inner psychological universe into objectivity, in what can only be explained as an explosion of consciousness or an illumination that translated itself from subjective into objective reality. Invisible became visible, intangible became solid and all species ventured into a never before experienced adventure of a new kind of consciousness. I think for purposes of this article, you could say that "Life Began" on earth at the time that dream bodies finally became physical, the awakening of the species, when the first physical foot felt the first physical pain when he stepped on a sharp rock, but that is up to you where to draw the line. There is much left not said, but unfortunately, our space here is limited, and a thousand books written over a thousand years could not adequately explain this miracle of life that happened so long ago and is still happening today.